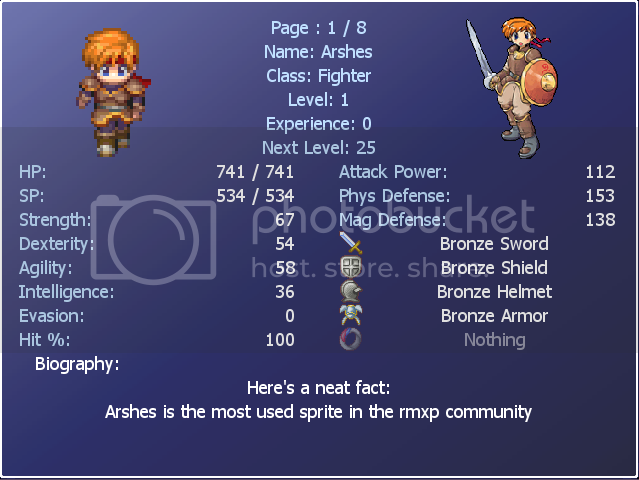 I apologize for necroposting (and just appearing after being gone for a really long time just to necropost <_<) but does anyone here know of a way to get this to appear as the default status screen by going to status in the menu instead of needing an event+script reference to call it? I have it working and I vastly prefer this screen to the default one. I didn't check any of that, but I see no reason why it should not work. Wow. I actually tried a strategy really similar to that before posting here, though I was trying to edit the references in Scene_Status rather than Scene_Menu (Don't worry I restored it to default). At least I know I had the right idea. XD Thanks for your help. It works perfectly. Level up for quick help and for always helping me despite my tendency to disappear lol.